The President, Shri Ram Nath Kovind addressing after inaugurating the Centre for Geoinformatics Application in Rural Development (CGARD) Technology Centre, at Antananarivo, in Madagascar on March 14, 2018. The President of Madagascar, Mr. Hery Rajaonarimampianina and the Minister of State for Health & Family Welfare, Shri Ashwini Kumar Choubey are also seen. New Delhi: The President of India, Shri Ram Nath Kovind addressed the students, faculty and academic community of the University of Antananarivo in Madagascar today (March 15, 2018) before concluding his state visit to Mauritius and Madagascar. Our common goal of a prosperous, inclusive and sustainable world, President Kovind said, has led to our countries supporting each other in bilateral and multilateral forums. Madagascar was a distinguished participant at the first summit of the recent International Solar Alliance in New Delhi. As an island nation, Madagascar understands better than most the risks of climate change and the need to move away from fossil fuels towards renewable and particularly solar energy. As an ISA member state Madagascar will be accessing a solar grant pilot project to be commissioned by India’s National Institute of Solar Energy. The President said that Madagascar and India are both young countries, with a determination and drive to change our destinies. Young people in our countries see the same dreams. We need to work together to make them realise those dreams. It is fitting that at the base of the Madagascar-India relationship is education cooperation. India offers higher-education scholarships to Malagasy students under various heads – including the Indian Technical and Economic Cooperation programme, the India Africa Forum Summit initiative, and the C.V. Raman Fellowship. So far 355 Malagasy boys and girls have availed these scholarships. We look forward to welcoming many, many more. 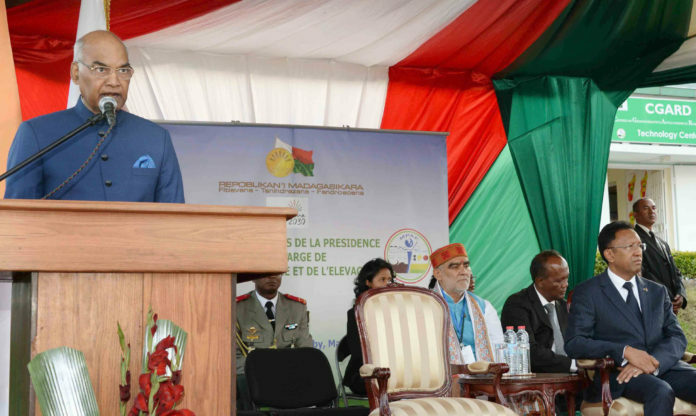 The President said that the youth of Madagascar are the future of this country. And along with the youth of India they will help build a better world for the 21st century. Malagasy people will always enjoy a warm welcome in India, whether they come as students or tourists or for business. India is teeming with opportunities but those opportunities are not for us alone. We would want to make our friends in Madagascar a part of those opportunities. Earlier this morning the President interacted with members of the India-Madagascar Business Forum and urged them to further trade and business opportunities. Following the delegation-level talks led by the Presidents of the two countries on Wednesday (March 14, 2018), India offered Madagascar a USD 80.7 million LoC for agriculture and mechanisation. On Wednesday evening, the President also attended an Indian community reception in Antananarivo. Addressing the Indian community, the heritage of which dates back over two centuries, the President said that as we embark on a new journey in Madagascar, the Indian community has an important role to play in enhancing and building our ties with the Malagasy people. Both India and Madagascar have gone through similar political and socio-economic trajectories and we have much to share and learn from each other. The President said that India is proud of its diaspora and their achievements. They are true ambassadors of India as they nurture and maintain their Indian-ness among the traditions of their adopted home. The Government of India has taken several initiatives for engaging the diaspora around the world. He called upon members of the Indian community to plug into the changes happening in India. He stated that these would help create new opportunities not just for them but also for India-Madagascar relations.